He is such a beautiful, sweet little man and very smart! He has completed his puppy preschool and then have gone onto juvenile classes and passed all his exams Thankyou for giving us such a beautiful little man with the best temperament! Hi Trish We got Loofy 1 year ago (2/08/14). I just wanted to drop you a line and say thank you so very much for giving us the most amazing, loving, incredible dog ever. She is an absolute joy and she is great with my young girls. You picked the perfect dog for us. She loves everyone she meets and gets very excited when we have visitors. When we left the groomers today she had to say goodbye to all the staff and the other dogs first. Thank you so much for giving Tess to us! She is just perfect for our little family. Ollie is doing fabulously. He's such a bundle of fun. Thought you'd like this snapshot. He took the sweet potatoes hostage and gave them pride of place on his blanket. Then he brought his beloved bunny over to see his treasures. ​All is going well with Ted, we are in looooove to say the least. He's such a gorgeous boy and loves his afternoon car trip to school pick up. All the kids make a big fuss of him with lots of cuddles and pats. I've attached a few photos for you. I would recommend your puppies to anyone. Hope you are well and the new puppies are thriving. Just wanted to send you a photo of Frankie, he has grown so beautifully over the past couple of weeks, he almost seems to have doubled in size. He has such a beautiful nature and character and so much fun, exactly what we wanted. He enjoys hours of fun with all of us and we can't wait to be able to take him out. He has been so easy and has basically trained himself, already goes through the night without any accidents. Thanks so much for such a beautiful boy. just thought you might like an update on our gorgeous little fur ball, Oscar. He is just adorable ( as you can see) though at times, loves to be a puppy and mischievous, but we love him to pieces. He loves to socialize and we take him to the local beach in the morning for a walk and interaction with other dogs and people. Ross goes for his morning swim then I go for my 6km walk while the boys hang out at the local cafe. Recently we took him for his first holiday in our caravan for a week and it all went well. He loves the car and just being with us. He is very clever and has learnt to recognise a few of his toys by name. He waits for his food on his mat until he gets the “Okay” instruction. He enjoys fetching his ball in the back yard and will return and release it. He still has his “mad dog” moments but all three of us are learning to cope and deal with it better. Hope you enjoy the photos and thank you once again Trish for little Oscar. Regards Jo, Ross and Oscar. A quick update on Miss Marple - Rosie. She has settled in well and is all that we wished for - intelligent , affectionate , playful and responsive. Thank you again for the puppy notes they have been really useful. Rosie arrived in good state with her blanket & little toy. Since the third night she has happily slept through in her crate. She is very quick to learn & is already pretty good on her version of puppy fetch. Toilet training is progressing well & she is growing like a weed. Her curious & enthusiastic responses to new experiences are a delight. She alternates energetic play & restorative naps, loves company & has a great sense of fun. She also has a determined streak that adds to her character , nicely tempered by her sensitive nature & willingness to please. As you suggested regular exercise and training are definitely a must to continue to keep her happy and challenged as she grows. We are truly delighted with our new family member, she has fitted in so well and added much joy. Just a quick email to say thank you for providing such a beautiful puppy for our family. Jet has settled in extremely well and has finished his puppy school today. 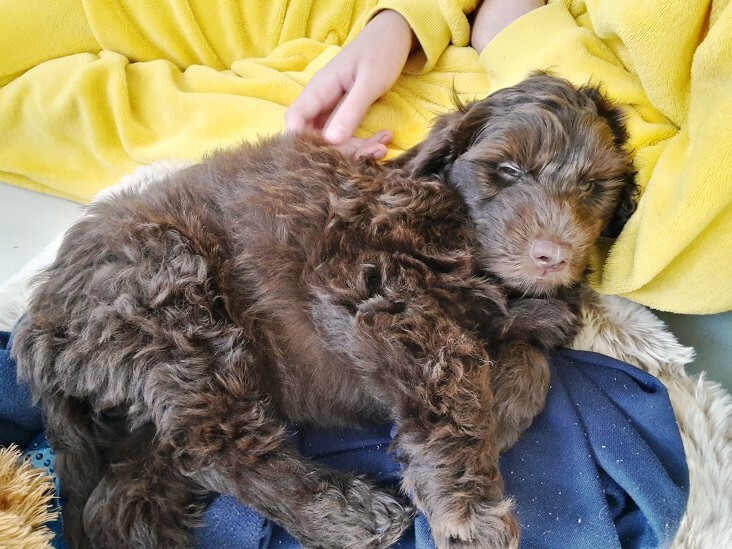 Jet is definitely a smart little puppy and has mastered toilet training quickly with only a few minor accidents here and there which generally has been our own fault. He loves to play outside, and his favourite in the house is our other labradoodle Fellah. He is very confident with a good rough and tumble and can dart extremely fast around our house and in the garden. He also learnt very quickly that the best place to hide when he has something he shouldn’t is under our king size bed, right in the middle. Our son has shown great interest in Jet. And as a result when he gets home from kindy, he will always take both dogs outside for a play. Most mornings he will have a good play with them too. I’m sure our whole street hears Evan outside at 6.30 in the morning saying “Jet toilet” over and over! What a wonderful way for him to learn some responsibility. I’ve attached some photos for you, and once again, wanted to thank you- Jet has already bought so much joy into our lives. I thought you might like an updated pic of Marley. He has grown heaps, and he is quite a Chunky little Man compared to Murphy, he has massive legs & feet for a baby. He's just turned 4 months old and is doing really well at puppy school. He has a very affectionate nature and is never far from us if he can help it and sleeps at our feet when we watch TV of a night. He and Murph get on so well and are really great mates. Romeo has been named “Buddy” and is settling in beautifully with our family. My eldest son who has a fear of dogs was devastated when we surprised them with the pup yesterday, he locked himself in his room crying for an hour. But after some gentle coaxing and encouragement he gave Buddy a pat and 7hrs later was holding him on his lap and now absolutely loves him! My daughter and 2 other sons were super excited with the surprise and needless to say Buddy is well loved by all in our family. Thank you for giving him such a wonderful start to life, we are so grateful to have him. Hi Trish, Just thought I’d let you know how Abby is progressing. She likes to play hide and seek with her toys and is very good at sniffing them out from the hiding places. She is very energetic and really gives Rufus a hard time who is extremely patient with her. Abby is thriving, mischievous and great company. She loves her cuddles and snuggling on the couch of an evening. Thanks again for a fabulous dog. Thank you once again for choosing us to be the proud owners of such a gorgeous pup, we have named him Larry. He learnt to sit within a couple of days and can now shake as well. He loves his toys, collecting leaves and flowers. He'll be starting puppy school very soon. WE LOVE HIMMMM!!!! HE IS THE MOST AMAZING DOG EVERR!!!! Here are some pictures!! You are an amazing breeder, so glad I found you!! Thought I’d drop you a line and let you know that Archie’s doing great. He’s been attending puppy school twice a week and from the first night was the most sociable pup there playing with everything from Great Danes to Shitzus. At night he hasn't given so much as a whimper and he’s learnt to sit, drop, stay, fetch and is in the process of learning to roll over. The nipping has decreased considerably and he’s extremely tolerant of our youngest, Madeleine, who constantly wants to hug him and tell him that he’s her best friend. Thanks again for giving us the perfect pup! ​Hi Trish, Toby is doing fine and spends the day in the office with me. He has key responsibilities of checking deliveries and keeping everyone's spirits up. We take a long walk during the day and he has grown close to our hearts. He is very playful and loves doing tricks he has a whole resume of tricks. I love the colour of his coat it is just perfect. He draws a lot of attention from all quarters no matter where we go with him. Thanks for a wonderful companion. We have a small household- my son Peter and myself. Peter is 5.5 years old, he is a sensitive child with heightened sensory, Peter also experience displacement distress when he spends time away from home- such as visiting his dad. Archie proved to be a promising therapy dog with his high levels of intelligence in obedience training and his acute sensitivity towards my son Peter. Archie would nudge and snuggle with Peter when he senses escalating build up of Peter's emotions, and most times this would distract and circumvent Peter's emotional meltdown. Sometimes when the meltdown is the only way for Peter to release the sadness and built up frustration, Archie would lay next to Peter, or follow him about faithfully. At the end of each day, Peter and Archie are inseparable, I have attached the pictures of Archie staring intently at Peter in bed, after a recent few days of adjustment. Archie deserves a medal, for his patience and love for Peter, his supportive behaviour towards Peter was natural and instinctive and not related to obedience training. I highly recommend Misty Mountain Labradoodle for their quality breeding of labradoodles and Trish for her ongoing support on care regime. Just wanted to let you know that Henry has settled in beautifully. He is already sitting, shaking and fetching on command, sleeps from 8.30pm - 6am in his crate and is pretty much toilet trained - all in one week! He is super smart, so it will be good when he starts preschool in a couple of weeks. He is getting along well with my parents old dog, he's had to be put in his place a few times but he's quickly learning his boundaries. They have a big play morning and afternoon, which is very cute, Henry runs like crazy! Nearly two weeks in and we all adore Kira (named after a dog the children met in Germany earlier this year- I wanted Ellie but my vote didn't count!). She is everything she is supposed to be - affectionate, intelligent, a bundle of energy, learns quickly and a wonderful addition to the household. She has settled in very well and has learnt to be toilet trained very quickly. She already takes herself outside whenever she needs to and tells us if she needs to go to the loo during the night. She has responded very well to the helpful clues you provided in the notes. She loves cuddles as you promised! We are thrilled with her- thanks so much for a beautiful puppy. So sorry for the delay in updating you on Mo. She is completely at home in the Richardson household and we all adore her so much. Including Ollie who was a little unsure about having a pet. She is very smart and we’ve had some puppy training, and, as a result she’s like part of the furniture now. We can’t imagine life without her. Mo sleeps in the house at night (outside of her crate and occasionally we find her on our beds by morning, but don’t mind as we adore her so much) and she spends her days exploring our large yard. We walk her everyday, which she loves and bath her once a week. She doesn’t mind the bath but definitely prefers going on a walk! Myla (our 7-year-old) treats her like a teddy bear with lots of hugs, but Mo doesn’t seem to mind at all. Whatever is going on in the household, Mo has her nose in it and we seriously can’t imagine life any other way now. She is settling in beautifully. She is gentle, curious, intelligent, cheeky and so incredibly smoochy and I absolutely adore her. Not to mention, she is just a beautiful looking puppy. After a few quiet days of settling in at home, Crumpet has been to the vet, sat in and watched my trapeze class, ( with my coach as puppy minder) been to week 1 of puppy school and even gone for a quick trip to the garden section of Bunnings in the trolley!!! She has more or less nailed toilet training, knows her name, settled into night sleeping in the crate next to my bed, happily tolerates a little grooming, ( well, she falls asleep) and has totally nailed siting at your feet as a cue in clicker training. She’s also had a few visitors! Her favourite toys are anything she can steal ( don’t mind the dozen or more toys I have bought her), and plays in the water out of the watering can! ( I’m looking forward to getting her to the the doggy beach when she’s ready). Her favourite place to sleep.... on my lap! Our house Cat is not impressed...... but she’ll come around in time, and she is getting a tonne of love too. I cannot commend you more highly for raising such a delightful, gentle, loving and intelligent little creature. Hi Trish, Thought you might like to see our little girl so settled. Thank you for her, she is just beautiful. We love this little girl so much, she has such a lovely personality and you have trained her so well. Thank you! Just a quick email to tell you how Snickers (Rusty) is settling in. Our son is so in love with him! He is such a loving, fun and cuddly pup! We have had no issues with him sleeping and becoming settled. He has already become a very loved part of our family and I don’t know how we ever lived without him. He has a beautiful temperament and loves lots of snuggles and a good play with his new big brother. Thank you for picking the right pup for us. He is so beautiful and we love him very much. I really wanted to send you through a few photos to show you how much our little boy Oliver - we kept the name as it suited him (now 5 months and 2 weeks) has grown. He loves water (a lot! ), playing, hugs, sleeping and going for little walks. I just wanted to let you know that Kevin (Vargo) has settled in beautifully with us. We love him so much already. He is such a smart and clever little boy who has already taken to potty training so well. He understands 'sit' perfectly and we have already moved on to 'down' and 'stay', which he is taking to like a genius. He has already grown so much and loves to zoom around in the yard, chew all his many toys and sleep. Lots and lots of sleep. We wanted to say thank you for all of the hard work you have put into raising our puppy. It sincerely shows. Kevin is calm around all household noises and socialises with all our extended family's pets so well (who are all vaccinated, of course). We absolutely adore him and dote on him. Hope you’re well. Just thought I’d send you a quick update on our little Blanche. She is settling in perfectly, she is super confident and adventurous. She loves meeting new people and is very curious. She is so well adjusted, even on our first night home she never cried, took herself to bed and woke up only once very briefly during the night! She is getting very good at taking herself to the toilet, and she likes games and learning new things (mostly for the treats we suspect). She’s also a big poser! Hope you like the pics! You’ve raised such a gorgeous pup, she is just perfect for us and we can’t thank you enough.